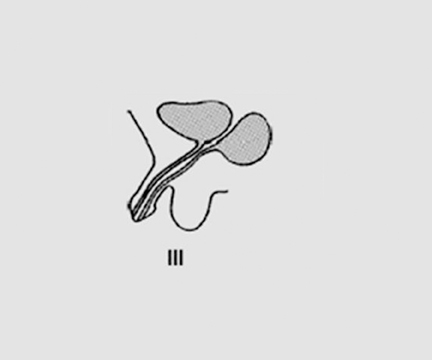 A diagnosis of complete duplication of urethra type 2A-1 as per Effmann’s classification (see discussion for classification) was made. A plain radiograph of the abdomen and pelvis was done to look for any bony abnormalities. 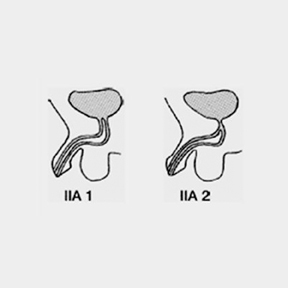 Dynamic retrograde urethrography was requested as a part of routine urological evaluation, which revealed complete duplication of the penile and bulbous urethra (Figures 1 and 2). However the posterior urethra could not be well evaluated. This was, hence, followed by a voiding cystourethrography, which revealed a complete duplication of the anterior as well as posterior urethra (Figure 3). However, the bladder was normal. 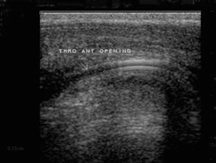 On an academic basis, a sonourethrogram was performed using a linear 12-7 MHz high-resolution transducer. 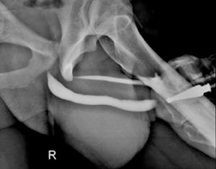 As the ventral urethral meati was wider in caliber as compared to the dorsal, an infant feeding tube was passed through the dorsal urethral meatus and an adaptor was attached to the ventral urethral meatus. 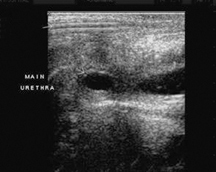 Both urethrae were then simultaneously flushed with normal saline, under real-time ultrasound, which showed saline entering the urinary bladder through two separate channels (Figures 4 and 5). 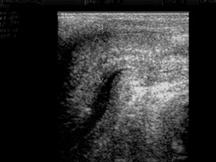 No plaques or calcifications along these urethral channels were detected on ultrasound examination. A detailed ultrasound evaluation of the abdomen was done, which revealed both the kidneys to be normal in position and normal in size, shape and echo texture. There was no hydronephrosis or hydroureter bilaterally. Magnetic resonance imaging (MRI) was undertaken for further anatomical delineation of this entity and to rule out any associated vertebral anomalies. Infant feeding tubes were passed through both urethrae, so as to distend them. 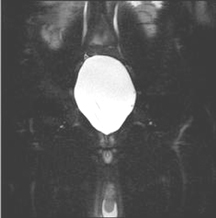 Routine T1WI and heavily weighted T2WI in axial and coronal plane were obtained with both infant feeding tubes in position, which were seen entering the bladder through two completely different urethral channels (Figures 6 and 7). Urethral duplication is a rare congenital anomaly with approximately 200 cases described in literature.1 Most of the reported cases are that of incomplete duplications. Complete duplication is rare only 20 cases have been reported until now.2 This anomaly is most common in males and very few cases have been reported in females.1-7 Several theories have been proposed to explain urethral duplication, including, misalignment of the termination of the cloacal membrane with the genital tubercle.3 However, no single theory seems to explain all the various types of anomalies. Most patients are asymptomatic except for a double stream, though some of them can present with urinary tract infections, incontinence and bladder outflow tract obstruction. A child may be brought, by the mother, just because of the dorsal opening. Genitourinary anomalies and lumbar spine anomalies of the colon have been reported to be associated with this condition.4 There have been various attempts to classify urethral duplication. 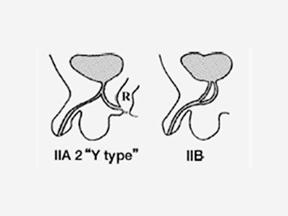 The most commonly used classification is by Effmann et al.8 (Figure 8) This classification is functional, however it does not distinguish sagittal from coronal duplications.1 According to this classification, our case belonged to type 2A-1. In Woodhouse and Williams classification, sagittal and coronal duplications were categorized, but anatomical details were not well addressed.7 Urethral duplication is rarely associated with bladder duplication, which is then, more commonly a coronal or saggital duplication.5 In contrast with bladder duplication, urethral duplication is more commonly saggital.3 It is important to recognize and preserve the functional urethra, which is usually wide in caliber with good sphincteric function and normal verumontanum. Differential diagnosis for duplication of urethra should include fistulous tract resulting from instrumentation, operative procedures and infections. Dynamic retrograde urethrography and micturating cystourethrography are being used for urethral imaging. However, as these procedures are associated with exposure to radiation, an alternative imaging modality like sonourethrogram is being evaluated and fast gaining acceptance. Sonourethrogram has definite advantages in that it isa real-time study with no radiation hazards and does not use iodinated contrast media. It can also be used to detect any plaques and calcifications, which could be associated with chordee. 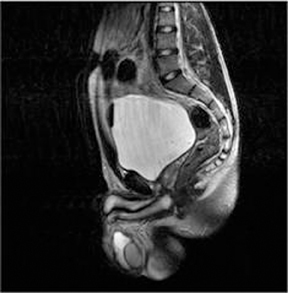 MRI helps in delineating urethral and periurethral soft tissues noninvasively with routinely used sequences such as T1WI and heavilyT2 WI in axial, sagittal and coronal plane. In congenital anomalies it is mainly reserved for intersex anomalies and complex genitourinary anomalies. The multiplanar capability and excellent soft tissue contrast offered by MRI are definite advantages, however, cost and availability are limitations. Sonourethrogram and MRI are now being used as an adjunct to voiding cystourethrography and retrograde urethrography in urethralimaging. 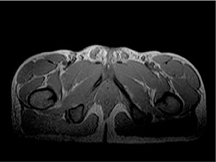 To our knowledge this is the first case report describing the features of complete duplication of urethra on sonourethrogram and MRI. Knowledge of urethral duplication is important with respect to surgical procedures. Surgery should be considered in patients with annoying symptoms, such as double stream or cosmetic deformity, such as epispadiac meatus. Treatment should aim at restoring the functional normalcy of the genitourinary tract and correction of the chordee, when present, should be undertaken. Surgical management should be tailored to the individual type of duplication. The outcome is usually favorable in most cases. Urethral duplication, although extremely rare, has long been one of most intriguing of congenital anomalies. Apart from normal radiological procedures of dynamic retrograde urethrography and cystography, we have attempted to present the sonourethrogram and MRI features of this clinical entity, which, to our knowledge, has not been mentioned in the literature. A complete knowledge of the anatomy of the anomaly helps the treating surgeon to better plan his approach. Pippi Salle JL, Sibai H, Jacobson AI, et al. Bladder exstrophy associated with complete urethral duplication: A rare malformation with excellent prognosis. J Urol. 2001;165 (6 Pt 2): 2434-2437. Gupta NP, Ansari MS, Aron M, Mandal S. Y duplication of urethra with complete atresia of the orthotopic channel: 1-stage reconstruction. J Urol. 2000;163:949-950. Pippi Salle JL, Sibai H, Rosenstein D, et al. 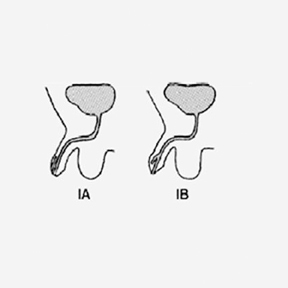 Urethral duplication in the male: Review of 16 cases. J Urol. 2000;163:1936-1940. Dajani AM, eL-Muhtasseb H, Kamal MF. Complete duplication of the bladder and urethra. J Urol. 1992;147:1079-1080. Ciftci AO, Senocak ME, Büyükpamukçu N, Hiçsönmez A. Complete duplication of the bladder and urethra: A case report and review of the literature. J Pediatr Surg. 1995; 30:1605-1606. Rabinovitch HH. Urethral duplication. Reconstructive surgery. Webster G, Kerby R, Goldwasser B, eds. Oxford:Blackwell Scientific Publications. 1993: Ch56,795-803. Woodhouse CR, Williams DI. Duplications of the lower urinary tract in children. Br J Urol. 1979; 51:481-487. Complete duplication of urethra. Appl Radiol.